This is one of those moments when I love taking excited Catholics to biblical lands. Last month we went to the sites of St. Paul around the Mediterranean. 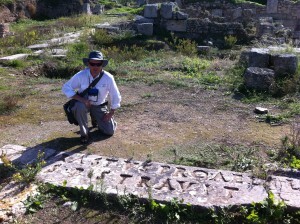 One of my favorite sites is the Erastus Stone off the beaten track at Ancient Corinth. Here is my 10-minute spontaneous talk about the truth of the Bible as discovered in the lands of the Bible. He had been in a coma for ten days, no speech, no voluntary movements of the body. His condition was such that the only question was whether he would live. There was no question of recovering from what was diagnosed as permanent and inoperable brain damage… I was about to leave his hospital room. But then a thought came to me. “That Vincentian priest. 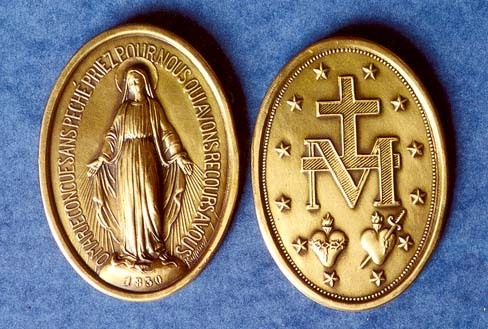 He said, ‘The Miraculous Medal works.’…No sooner did I finish the prayer of enrolling the boy in the Confraternity than he… opened his eyes for the first time in two weeks. He saw his mother and said, “Ma, I want some ice cream.” He had been given only intravenous feeding…. Leonard writes: After sharing this on Facebook there were quite a few people who objected because there was an inanimate object being used in healing. They thought it was idolatry. These people believed they were Biblically literate and yet they had absolutely no comprehension of the way that God used inanimate objects in the Bible; and so I have included a note giving some of these verses! ENJOY!!! 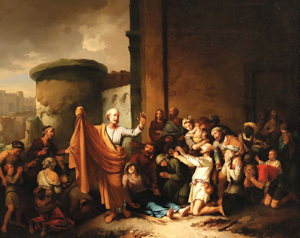 Cloths, bones and shadows used by God to heal and raise from the dead! “So they cast the dead man into the grave of Elisha, and everyone went off. But when the man came in contact with the BONES of Elisha, he came back to life and rose to his feet”(2 Kgs. 13:21). “So that they even carried out the sick into the streets, and laid them on beds and pallets, that as Peter came by at least his SHADOW might fall on some of them. The people also gathered from the towns around Jerusalem, bringing the sick and those afflicted with unclean spirits, and they were all healed” (Acts 5:15-16).